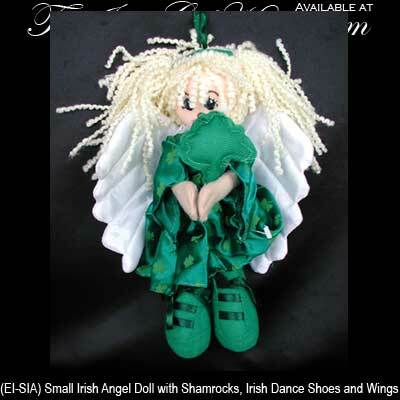 This soft Irish angel doll is enhanced with shamrocks. Features Velcro on Her Hands so that Her Hands can be Held Together. 9" Tall, Made of Cloth and Fabric, and Ribbon Laces on Her Irish Dance Shoes. Made in Ireland by J.C. Walsh and Sons. Shamrock Dress and Blonde Yarn Hair Accented with Green Ribbon.